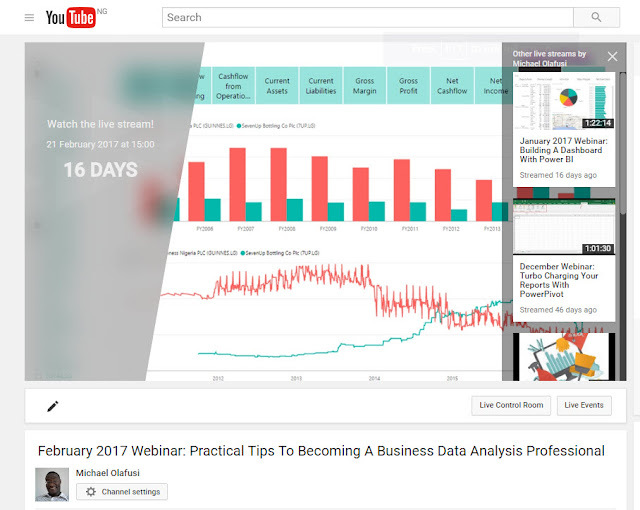 On Tuesday 21, February 2017 I will be sharing with you my super practical tips for breaking into the professional side of business data analysis. If you've ever imagined yourself becoming a business data analysis consultant, then this one webinar you wouldn't want to miss. Again, don't miss it! Add it to your calendar and save it, even set reminders. You can always be in the loop of our webinars by joining our webinar directory. Thanks for the wonderful article.Everly informative!.The only frown in this proposed webinar arrangement is the "timing".It is indeed an odd hour for people like us with traditional corporate work schedule(white collar working hours).I will really appreciate if the timing could be re-considered perhaps make convenient time slot for people with time-constraint. The timing is like a double edge sword. Some people prefer it's at work hours so they can use work internet and won't have to skip an weekend engagement to participate.